Home > PillowPets 18" > Disney Frozen Olaf 18"
My Pillow Pet Disney Frozen Olaf Toy - Size: Large 18"
Whose says that all My Pillow Pets have to be of real animals? We all know that one of the most popular mythical creatures for little girls is a Unicorn, so why not make it magical and call it the My Pillow Pets Disney Frozen Olaf. This item is sometimes called the My Pillow Pets Lavender Unicorn, and has everything you want from a Unicorn, a beautiful purple color, awesome looking horn, a white mane and paws, and a very soft and cuddly outside. 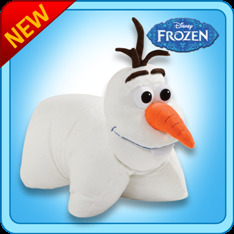 My Pillow Pets Disney Frozen Olaf might be exactly what you are looking for if you need a Christmas gift or birthday present for a special young daughter, niece, sister, friend, or relative in your life. This very fun toy, or pillow depending on how you are using it at the time, is very popular with children. There are numerous reasons why you should consider purchasing My Pillow Pets Disney Frozen Olaf as a gift, and not just because kids love them. They are made very well and are built to last, and if it has the My Pillow Pets name you are going to know you are getting a well made product. While there might be imitations out there, stick with the original company of the best build items.